ENTER THE AGE OF X-MAN! The perfect heroes for a perfect world! The X-Men have helped make the world into a utopia where living in fear and hatred is a thing of the past. 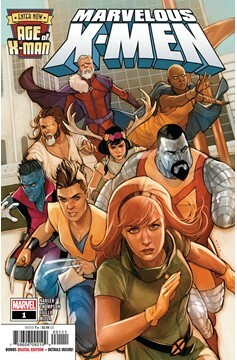 All people are united under the banner of mutantkind, and all of mutantkind idolizes the X-Men. Jean Grey! Colossus! Storm! X-23! X-Man! Nature Girl! Magneto! And of course, the amazing Nightcrawler! When danger threatens the world, the Marvelous X-Men set things right for the good of all. And no one dares say otherwise. Rated T+. Copyright © 2019 Fantom Comics Ltd.